This sculpture is based on the poem by the famous Yiddish writer Aaron Zeitlin, written in 1946. My sculpture memorializes the children who were murdered in Maidanek. It reflects Zeitlin's poem, and has no head, no arms, no legs. And no womb - there are, and will be, no children of Maidanak. It is carved in the grey stone of his "smoke and ashes." 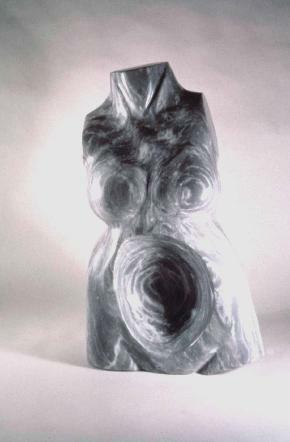 But my sculpture also depicts the strength of the torso as a symbol of the rebirth of the Jewish people after the Holocaust, something Zeitlin hinted at in his later poems. It is also signed in Yiddish, but with the letters in reverse so it can be read only with a mirror. This, in deference to Zeitlin's anger at God ("A world without God. . ." -- in Jewish homes, during mourning, mirrors are always covered) . 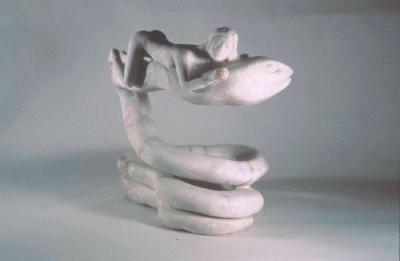 This sculpture depicts Eve taking the apple of knowledge with the help of the real hero of Genesis, the snake. It is the Jewish people's dedication to knowledge and rationality that is their "sin" and that has made them the target for persecution throughout the ages.